Just a short reminder of our regular weekly broadcasts on Wednesdays. 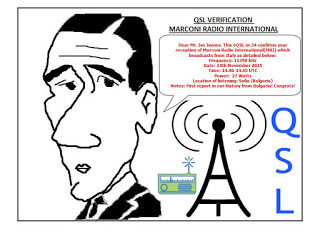 Marconi Radio International will once again be on air tomorrow 6 July 2016, as follows: 1830-1930 UTC on 15070 kHz (USB mode), 2000-2100 UTC and 2130-2230 UTC on 7700 kHz (USB Mode). Italian. Our station identification announcements are not only in English and Italian but also in French, German, Japanese, Spanish and Catalan. Last but not least, we need your help! If you use social networks, please post an announcement on Facebook or send out a tweet the day before the broadcast. You can also forward this message to a friend. This should help increase our potential audience.